Forum Description: This is the place to ask questions about invertebrates. So I thought I would seek advice from the board. Acclimation, placement - whatever you feel like posting about clams that you think might be helpfull. I agree with phys, except for the bare bottom. Tridacna clams will attach themselves to rocks but often they will throw themselves down to the sand. Most like to be in a sand bed. Follow the acclimation instructions that come with the clam from liveaquaria, or if instructions are missing, call me at 808-345-1049. 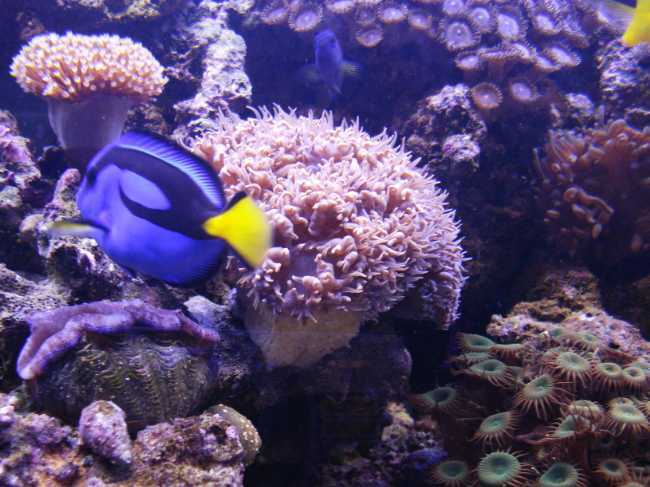 The way to feed is to add a couple drops of frozen Tahitian Blend Algae Paste(slurry) to a small cup of tank water, stir briefly until mixed then pour directly in to the aquarium. Use enough that it turns the tank water just slightly green. This is part of my "whole tank feeding" regimen. It feeds many kinds of bugs and worms which then provides food for the larger animals on up the "food chain". 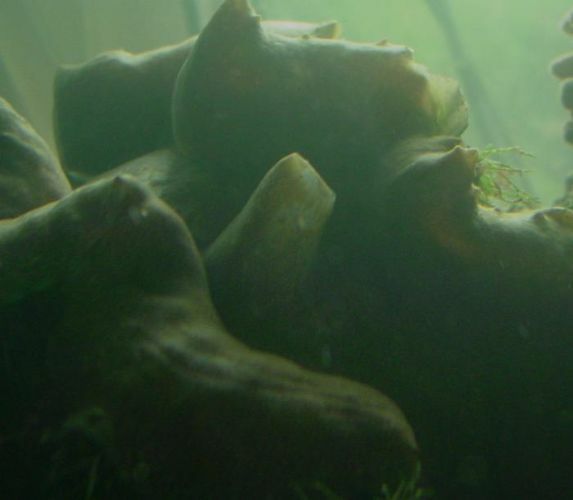 Clams filter it directly out of the water and along with good light, it helps Tridacna clams grow and flourish. This was my favorite Tridacna clam, a 9" Squamosa given to me by a friend. Put a piece of flat rock or a small flat piece of old coral skeleton under it, I had a large dead chalice piece that I use. It will attach to that then you can still move it around if you need to. I put sand around the piece so it looks like it's on the sand bed. 150 gal reef with 50 gal sump. Reef Octopus DCS-200 Skimmer. AI Sol Blues. When you put it in the tank, make sure you "burp" the clam. They can get an air bubble stuck inside them when exposed to air, so you just have to tip it to get any air bubble out. Since we are on the subject, I hope you don't mind just a little more info. Bringing home my Tridacna squamosa, it was so large that it had to be removed from the friends tank and set endways in a 5 gal bucket of it's tank water. When I put it in my tank, frankly I don't remember if I did anything to allow bubbles to burp. A day or so later I awoke to see it spewing a faint cloud swiftly from it's siphon tube. I then remembered a guest speaker, John Walch, had told us about the clam farms he had set up at several South Pacific islands. Setting really large clams out beside the raceways in the sun for a bit and then putting them back in the raceway caused them to spawn. It's really hard to see, the water had some phyto, but here is the pic of mine doing, what I believed at the time, was spawning. Great advice everyone! Thank you! Sure enough i came home to find the clam off the nice rock cradle I made and upside down on the bare bottom. I put him back and he seems to not have injured himself in the ordeal. Not sure what to do next since I don't want a repeat of this ordeal. get 2 inch slice of 3 to 4 inch diameter PVC pipe or a soup bowl. Put a flat rock/or some type of flat coral skeleton in bottom of it (a clam corral/trap). Place clam on top of the flat rock, if needed add a little sand or rocks so clam can stay upright. After a week or 2 the clam's foot will attach to the flat rock or coral. Then move the clam where you want it. Keep an eye on the clam, if you note it starting to detach, he does not like where he is at and move it. Whenever mine was going to move you could tell as the foot would start to release and you could see white strands from it. My clam moved 3 times in 3 years, they are cool but can be a pain. Like I said, it threw itself off the rocks to be on the sand. As in my pics above, a clam likes to bury itself partway in the sand by using its foot or, as my clam in another tank, to attach to a rock down between rocks or in a wide crack. I just saw a Youtube video of a clam farm in Palau showing clams being moved around. No "burping" They probably burp themselves. Thanks Mark! I'll read it right now. Btw Clam is doing great so far. Added a small bowl with sand and he seems as happy as... well a clam! Can someone point me to a sticky on how to attach images to posts? 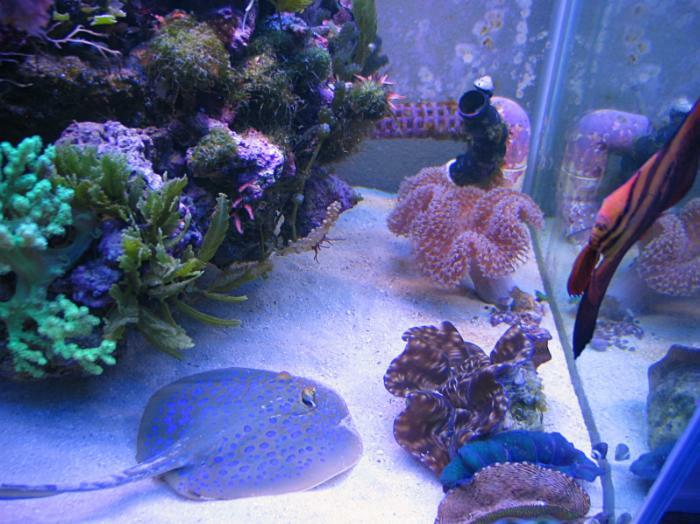 PS love the blue spotted stingray in your tank above. Pics in posts? We got it. Look in the Reefkeeping Tips. Why did I put it there? Because so many people needed the information. Knowledge is power. 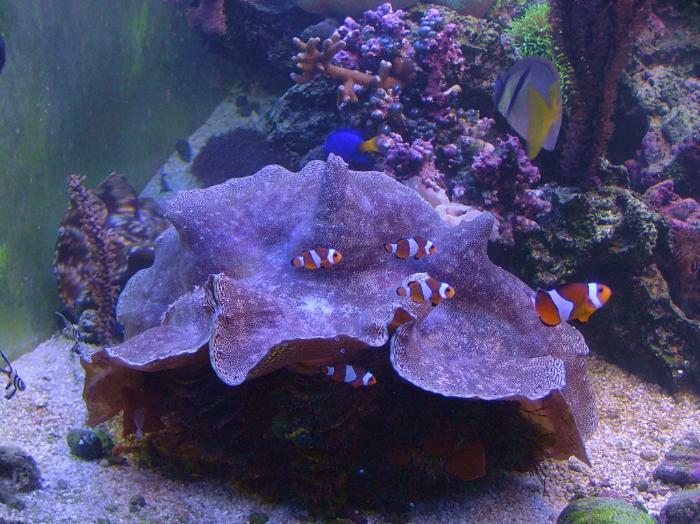 Read the Reefkeeping Tips and how to set up the affordable aquarium. It will give you knowledge and power.